Soon, the language these systems “speak” with one-another will change from today’s “4010” standard to the newly mandated 5010 standard. Compliance with this new standard is required to keep these systems talking to one another. If you have not started the migration process then you may have a great deal of work to do starting now. At healthcare technology consulting firm Celera Group, our partners and associates recognize that many organizations just do not know how to get started. If you are one of these, then this presentation is for you. Troy Abruzzo, Celera Group Partner and healthcare EDI and 5010-migration expert will provide a high-level overview of the 5010 requirements, compliance timeframes, and the migration process we use with our clients. Join us and keep your organization’s revenue cycle going. 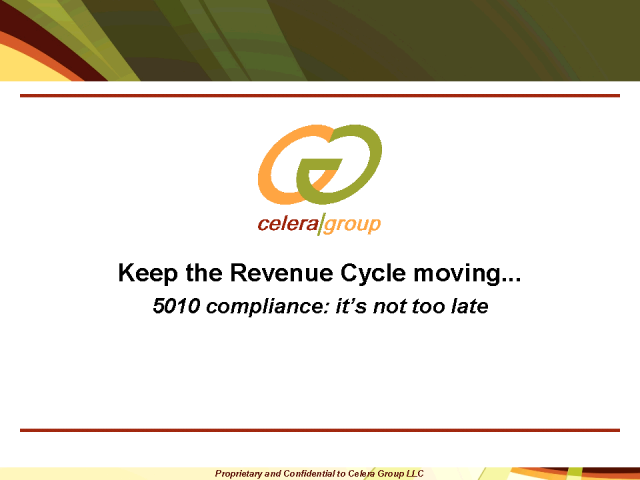 5010 compliance: It’s not too late.